Enjoy the picturesque scenery of Campania’s Amalfi Coast on this self-guided holiday. Walk through beautiful scenery up to Monte Tre Calli along rocky, narrow paths. 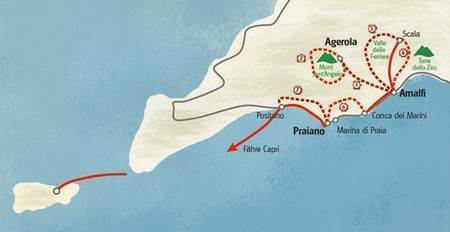 The route takes you through medieval villages and terraces, always with a sea view to Amalfi and on to Praiano. Follow the pilgrim path to the San Domenico monastery and continue down to Positano. You walk through lovely scenery up to Monte Tre Calli. Details: approx. 4.5 hours | 8km | Ascent 550m / Descent 550m. Walk along an old mule track to the grotto of Santa Barbara through a narrow, cave-like valley with views over the turquoise sea and the gorge of Furore. Continue to Amalfi, where you can visit monasteries, churches and beautiful squares. Details: approx. 4.5 hours | 11km | Ascent 250m / Descent 800m. Walk from Amalfi to Pontone, where you visit Torre dello Ziro, a watchtower built as an outpost to keep watch for pirates. From here you enjoy scenic views to Amalfi, Atrani and the whole of the Amalfi Coast. On your way the visit of “the valley of the mills” is worth it - the valley is dotted with the ruins of abandoned paper mills, now taken over by plants. You continue walking to Ravello and down to Atrani, a little village that has retained the same ambience as 500 years ago. Details: approx. 4.5 hours | 10km | Ascent 500m / Descent 500m. Take the bus to Scala. Walk on a ridge into the Valle delle Ferriere nature reserve with its own distinct micro-climate. Here you'll find waterfalls, tranquil resting places and many scenic viewpoints along the way. Continue to the medieval terraced town of Pogerola before returning to Amalfi. Details: approx. 5 hours | 10km | Ascent 250m / Descent 600m. Take a bus to Conca dei Marini. Starting at the 10th Century Santa Rosa you walk down to Marina di Furore. Along the path of the lovers 'Via dell’ Amore' you walk to the green Praia valley. Picturesque Praiano is your target today. Details: approx. 4.5 | 10km | Ascent 350m / Descent 600m. Walk along the pilgrim path to San Domenico monastery. Continue walking on the 'Path of Gods' where Zeus is said to have walked, to Nocelle and Montepertuso. Here you continue down the valley to Positano. Details: approx. 4.5 hours | 9km | Ascent 400m / Descent 400m. Daily walking times of approx 5 hrs on high altitude paths (hiking paths, stairways), some steep ascents are possible. Sure footedness is required. As you almost always start and end at sea level a difference of elevation from 250 to max. 800m per day up and down has to be taken into account. We recommend flying to Naples Airport. Continue to Agerola/Bomerano by bus/train. Change of bus/train approx. 2 times, duration approx. 2.5 hours. On the return from Praiano/Positano by bus to Sorrento and by train or bus onwards to Naples. Duration approx. 1.5 hrs. Private transfers can be booked from/to Naples airport. The Amalfi Coast tour stays in pretty 2 and 3 star hotels and country hotels carefully chosen for their location, hospitality and proximity to your tour route.